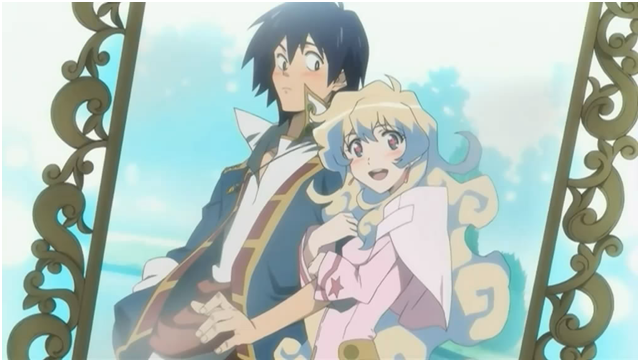 One of my favorite parts of Gurren Lagann is the love story of Simon and Nia. It’s one of the most adorable relationships I have ever seen in anything. It’s genuine, sweet, and their dialogue together makes you want to die from cuteness over-exposure. WARNING: Lots of spoilers below. Read at your own risk! 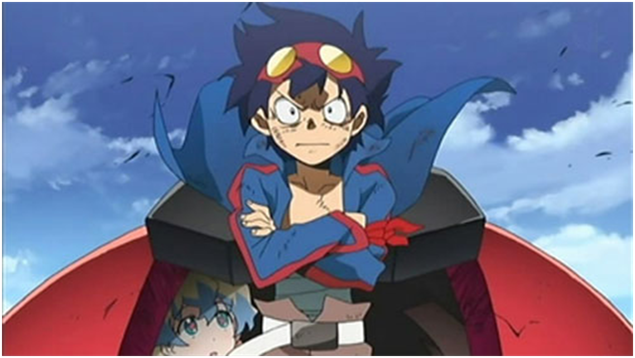 Nia’s character is introduced at a pretty rough part of the show; Simon’s best friend, the larger-than-life Kamina, has tragically died in battle, and it’s sort of Simon’s fault. Prior to this important battle, Simon had his heart broken by Yoko, the girl they had been travelling with who often looked out for him. Because of this heartbreak, it prevents him from fully concentrating on the battle at hand, and Kamina puts himself in a dangerous situation to try and get him to concentrate. The cutest. Because I say so. So, as to be expected, Simon is taking Kamina’s death very hard, fighting alone while being overwhelmed with depression and the futile desire to be like “Bro”. While Simon was wandering out alone, he stumbles across Nia. In a box. Thrown away. Pretty comfy, once you get past the whole “garbage” part. A pretty odd first meeting, but in these first interactions, it’s pretty obvious that Nia is the better match for Simon. In the episodes that follow, she is the sole force that brings Simon out of his depression and gives him comfort and the strength to not be like “Bro”, but himself. When no one else could possibly help him, she was there for him, and this support continues on for the entirety of the show. 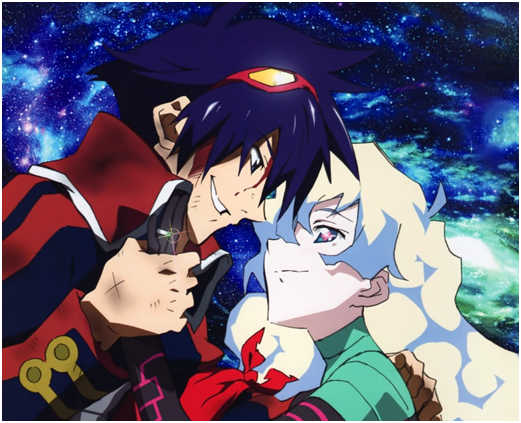 And even when he still upset about Kamina’s death, Simon is still able to bring himself to rescue Nia several times, again emphasizing his immediate attachment to her and their natural bond. In turn, Nia’s unwavering faith in him during her times of need is indicative of her own feelings towards him. Simon pretty much kills anything in front of him from this point on. Their bond is strengthened and put to the ultimate test in the following seven years. Simon and Nia have been a couple for a long time now, so close in fact that he has finally gotten the courage to propose to her. 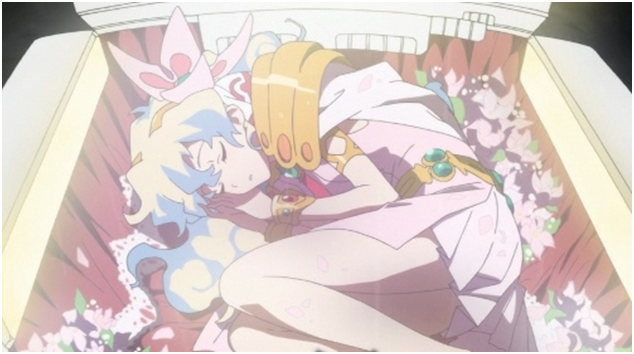 Simon has always been pretty shy about admitting his affections for Nia around others or to her (see: picture below), so for him to propose definitely says something about how much he has come to love her throughout the course of Gurren Lagann. If your heart doesn’t melt at this pic, then I can do nothing for you. Unfortunately, soon after this Nia is awakened as a messenger of beings that reside in the heart of the universe, called the Anti-Spiral, and this awakening changes her entire persona. 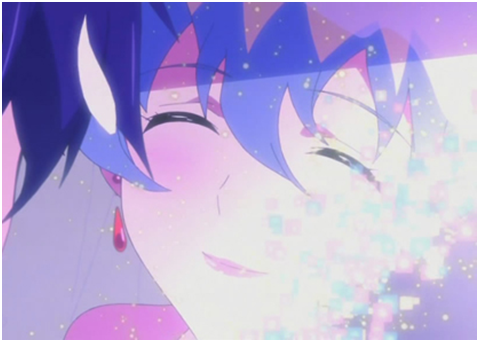 She teleports away from Earth and only appears to Simon in times of “despair”. Simon is visibly upset by this change in her and her actions, but he is determined to save her no matter what. In a raging battle in space, Nia comes to stand in the way between Simon and the source of victory against the first wave of enemies. Even though Nia’s new persona continues to insist that she and Simon are “completely incompatible”, he goes on to ask why she is still wearing the ring he gave her. From this, Simon is able to determine that her visits of wreaking “despair” on him were actually calls of help, implying that her real self is still present. This awareness of Nia’s plight’s for help restores her to her true personality, and before she is teleported back to the home world of the Anti-Spirals, she asks if Simon will promise to come for her, which he responds to with the series staple, “Who the hell do you think I am?” Their engagement ring becomes the symbol of their bond and love for each other during the ensuing battle in space, and said bond is the ultimate force that reunites them in the Anti-Spirals home world. With Nia finally rescued and reunited with Simon, they are finally able to go on to defeat the nemesis that threatens the existence of humanity and live peaceful lives. Happily ever…wait, are you serious? Or so we’re fooled into thinking. At the end of the show, Simon and Nia are getting married, and everything’s wonderful, but then…things take an unexpected turn for the worst when Nia suddenly ceases to exist. 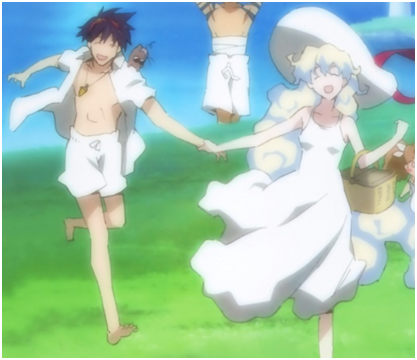 While I loathe Studio Gainax for ending their relationship in such a tragic way, there’s some comfort in seeing how happy Simon and Nia were in their last moments. Even though they wouldn’t be able to spend the rest of their lives together, they were still so happy and loving to one another till the very end. They both knew she would fade away, and yet they still wanted the happiness of marriage and everything it would symbolize for them. A touching love story with a bittersweet end, Simon and Nia’s relationship a prime example of the unconditional love and loyalty people can have for each other. 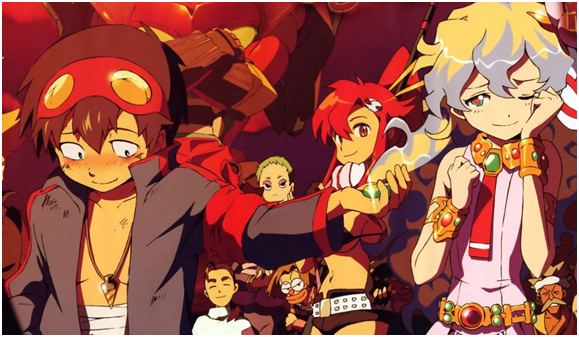 “How It Should Have Ended.” Official art by Studio Gainax…wait, what? Nia is my favorite. Well, Darry and Kinon are big contenders… but I digress. Can’t stop thinking that Nia and Simon will be together again one day, in this life or the next.